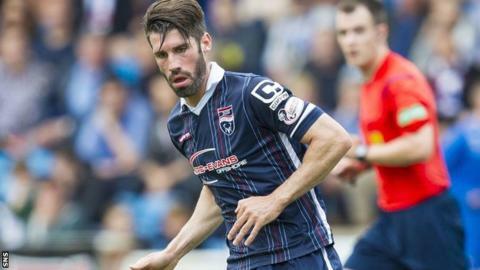 Ross County midfielder Rocco Quinn has signed for St Mirren until the end of the season. Quinn's contract at Victoria Park was due to expire in the summer, but County agreed to release him early to allow him to switch clubs. "Speaking to the manager here and his plans for the club, the way he wants to take the club forward, I think that was a big factor in it," Quinn said. "There were a few things he said that made me excited about coming here." The former Kilmarnock and Celtic midfielder says he was impressed by manager Alex Rae's vision for the Buddies. "He seems to have a good plan in place and there is a lot of good players at this club so I'm just happy to be here and looking forward to getting started," he told St Mirren's website. "I'll bring experience and I'll be giving nothing less than 100% for this club and these fans, I'll be looking to bring a lot to the table." Ross County manager Jim McIntyre paid tribute to the departing Quinn. "Rocco's been a fantastic professional for us since we came in the door," said McIntyre. "He played for a long time knowing that he needed hip surgery. I'll always be grateful to him for that because at that particular period we needed his experience, his leadership, the type of player and type of guy he is about the dressing room. "We just feel that there are five central midfielders and we're a bit heavy in there so we need to offload one. But he goes with our best wishes. "He's a fantastic professional and a fantastic man so we wish him well." Quinn joined County in 2011 from Queen of the South, having also had spells at Hamilton, Livingston, St Johnstone, Kilmarnock and Celtic.